An ambitious project is breaking ground on Hackney Road this year that will turn a pub into an entire precinct and raise the standard of living in one of Adelaide’s most affluent suburbs. The suburb of St Peters isn’t necessarily known for innovation. The boys college by the same name is revered for its sandstone buildings. The houses around St Peters College in the suburb of Hackney have ample lawns, hedged by walls and gates along leaf-lined streets in autumn. This suburb is known for tradition more so than transformation. In its flagship project, V Three will break ground on a development that promises to change the bucolic brand of Hackney with a dynamic re-working of the land at the corner of Hackney Road and Richmond Street. Owned by a consortium of AFL players and other notable Adelaideans, the Hackney Hotel re-development was conceived and planned in a joint venture with V Three – a vertically integrated group of companies specialising in development, capital advisory and services, founded by Ruan Perera and Wayne Henry. Each property in the development will have a view, and drone footage from the top floors reveals a near priceless vista over the Botanic Gardens towards Adelaide Oval in the west and St Peters College and hills in the east. Ruan tells us about the electronic bike share system they’re installing for their community, the small footprint retail premises that will be tenanted according to the needs of the residents and their desire to attract a cornerstone South Australian food and beverage operator to fill up the heritage Hackney Hotel building, which will remain an integral part of this innovative development. We’ve met Ruan and Wayne in front of the State Herbarium, just 800 metres from the site of V Three’s upcoming Botaniq development. The company directors are good sports, meeting us before 8AM to catch the early light. “These gardens are such an asset to the city,” says Wayne. 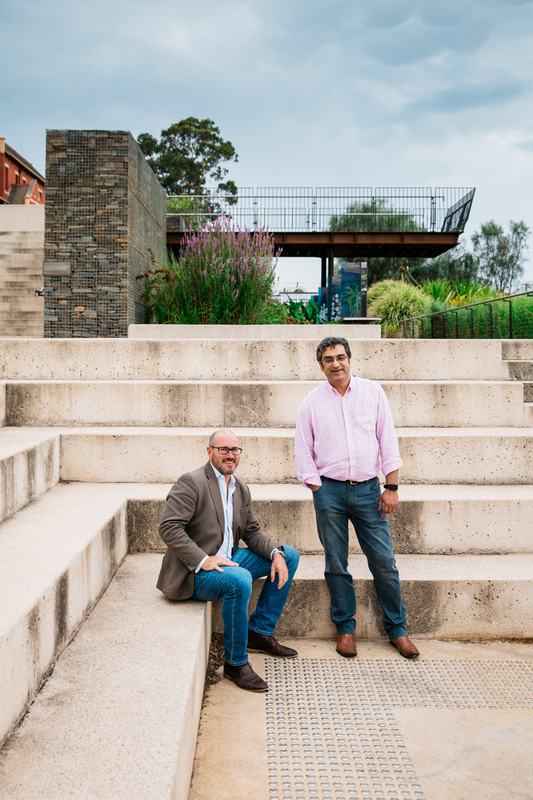 Ruan and Wayne say they formed V Three because they saw the opportunity for a mid-size company to bring a new standard of development to the market. They were particularly motivated by South Australia’s Strategic Plan under the previous Labor Government that called for infill development, strategically placed alongside commuter corridors. “We have a very tight focus on the inner metro area, where the surrounding suburbs are already rich in social fabric, and you’ve got access to schools and unis, to healthcare, to shopping, entertainment and experiences,” says Ruan. When V Three’s development goes on sale to owner-occupiers and investors this year, they won’t just be selling the bricks and mortar of their vision, as rendered by JPE Architects. They will be selling the Botanic Gardens, the Karrawirra Parri River Torrens, access to Adelaide Oval and shopping on The Parade and Rundle Street East. “What we could say, really, is that we’re focused not just on selling property but we are very much about offering a lifestyle and being part of that community for a very long time – in fact its entire future,” says Ruan. The vertically-integrated nature of V Three guarantees these developers are in it for the long haul. The three individual corporate entities (V3 Ventures, V3 Capital, V3 Services) provide value that goes well beyond the sale of square metres, into energy, transport and other services for the community that takes root at Botaniq. Ruan says a lot of the development’s lifestyle offerings have been made possible by great leaps forward in technology and through strategic partnerships with select companies who share V Three’s vision and ambition. He says some of the amenities Botaniq will deliver weren’t conceivable four years ago. The vision for Botaniq is only just starting to come into view for the public and V Three is eagerly anticipating Adelaide’s response.